I really need to work on some upcoming nutritional presentations (more to come! ), client pictures, my classes, consulting prep work, oh, and family things – (that reminds me, I really need to register my son for kindergarten, pay the bills, clean, do some laundry, and….ughhh!!). So, I thought, hey, what a great time to do a post! Okay, not really, but I really loved this and wanted to share. The kids and hubby loved it too! Anyway, the pictures might not be great and the wording might be off, so please ignore if so! The other day, while at Whole Foods, as my 5-year old was explaining to me that he was growing hair under his arms (thank goodness we don’t actually eat food with hormones or I might have believed him! ), I was trying to concentrate on what to cook for dinner. I saw some shiitake mushrooms and I knew I wanted to do something fun with them. I had read an article talking about how they were the “medicinal mushroom” and were great for the immune system. Regardless, I just love them. 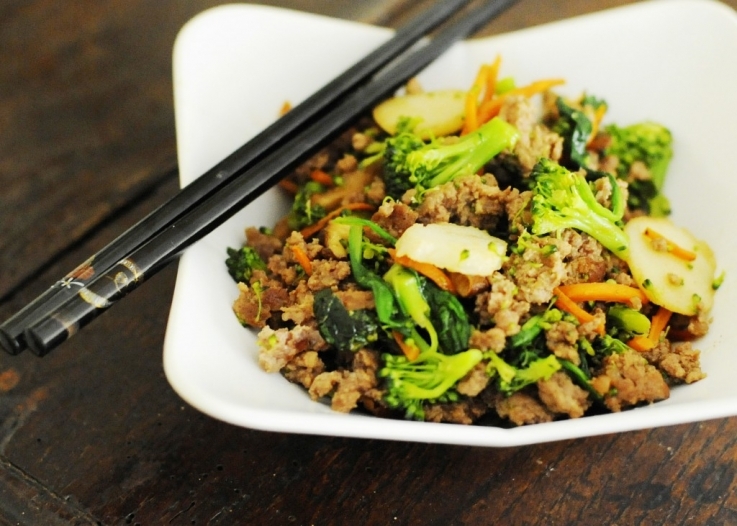 Anyway, for the sake of shiitake, we came up with this Oriental Ground Beef Veggie Mash. Get out a large pan and put about 1-2 tbsp of coconut oil so it melts in the pan. 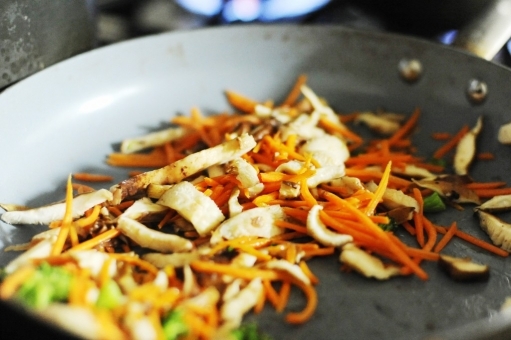 Then add the mushrooms and carrots and sauteed them until they start to get soft. Next, drizzle 2 tbsp roasted sesame oil (since unlike the coconut oil, it is not meant for high heat) and about 2 tbsp of organic tamari (gluten free soy sauce). 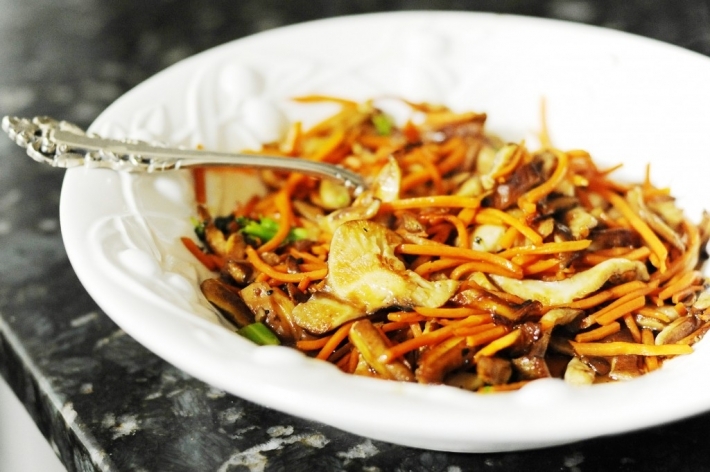 Now, set aside your mushroom and carrots once done and try not to eat them all. Mmmm, shiitake mushrooms…. Next get out a pot and start to boil a little bit of water so you can steam your broccoli. Then chopped the broccoli and put it in the pot so it can cook for just a few minutes. Be sure to not overcook it, especially since you’re going to cook it just a bit more once all of the food is together at the end. 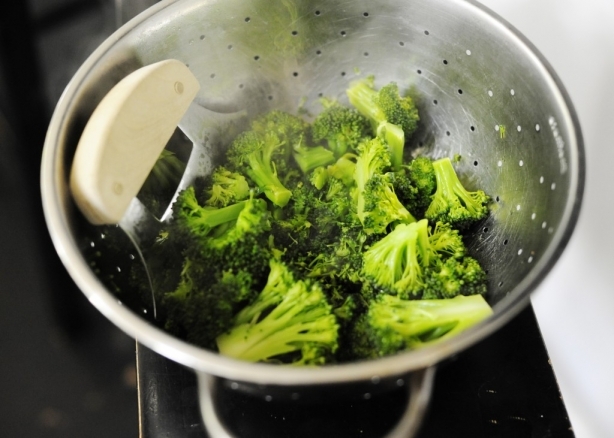 After just a few minutes, pour the broccoli into your colander. I used my Ulu knife to chop the broccoli even finer but you could use a regular knife or even skip this chopping part. Next, in the same pan you used for the carrots and mushrooms, add the meat and cook on both sides (I kept it in a big hunk) until brown. Then spread it out with a spatula and add some tamari (about 2 tbsp). 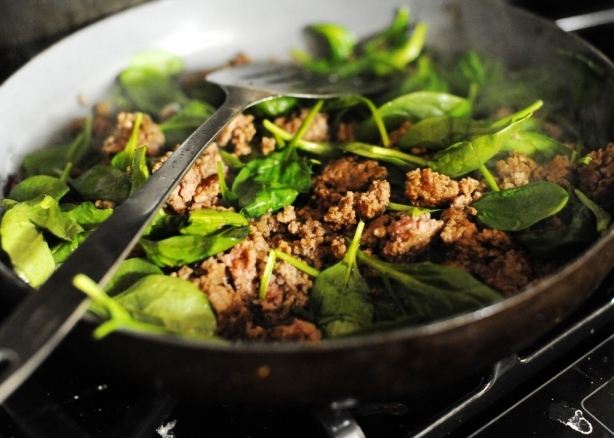 Once that is almost all brown, added 2-3 handfuls of spinach, stir it all together and let it cook for a few more minutes on low. Lastly (yup, already lastly), add about 1 tbsp fresh ginger, dash of salt and pepper, juice from your orange, and then the rest of the ingredients, cook on low for a few minutes and then it’s ready to serve! That was it! It only took about 30 minutes from prep to cooking and it was a great meal. 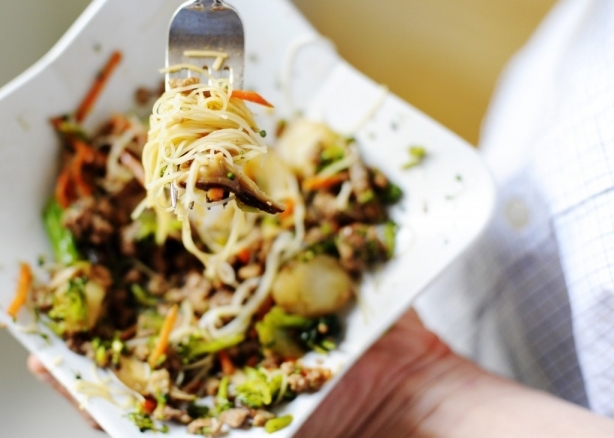 I ate it this way (see above) but for something different for my family, they tried some super thin (which made them fun) gluten free brown rice noodles by Annie Chuns. I usually don’t like to use noodles because I’d rather the family eat more veggies and meat (and less filler), but thought it would be a nice change for them. I do love that these noodles only have two ingredients, brown rice and water. I bought mine at Kroger, but you can get them online, or I would bet Whole Foods would have them. By the way, this is post-shower. They get dirty and greasy, but they aren’t that greasy!